Addressing reporters at State House, Abuja, following his decoration by President Muhammadu Buhari, Adamu promised to ensure the elections are credible. "We are professionals. We are going to stick by the rules. We are going to do the right thing. We will not go outside the ethics of our job to do things that are untoward. Everybody will be given a level-playing ground to play his or her politics," he said. According to him, "Adequate arrangement has been made to make sure that free and fair and credible elections take place in Nigeria. We are going to build up on the strategies put in place, to make sure that we have a hitch-free exercise." Adamu replaced Ibrahim Idris whose tenure ended yesterday having crossed the mandatory thresholds of 35 years in service and 60 years of age. The new police boss, who is from Lafia, Nasarawa State, and holds a BSc in Geography, will serve in acting capacity pending a confirmation. He enlisted into the Force February 1, 1986 as a Cadet Assistant Superintendent of Police. Before his appointment as acting Inspector General of Police, he was the head of the National Institute for Policy and Strategic Studies (NIPSS), Kuru, Jos, Plateau State. He was Commissioner of Police in Ekiti and Enugu States and also Assistant Inspector-General of Police in charge of Zone 5 Police Command Headquarters, Benin, Edo. Opposition political parties nevertheless have rolled out their expectations, even as they criticised Idris over alleged unprofessionalism. Leading the group, the Peoples Democratic Party (PDP) asked Adamu to learn a lesson from "the shameful end of Idris by immediately setting up the process of re-orientating and insulating the Force from partisan politics, while subjecting it to the tenets of democracy and the rule of law." It said the new IGP "must urgently take steps to address the bastardisation of promotion in the police under the last IGP where officers due for promotion were denied and only those endorsed by a cabal or who have enough money to buy their way through were promoted. This is in addition to immediately setting up a process that guarantees proper welfare of officers and men of the Nigeria police." In a statement by its spokesman, Kola Ologbondiyan, yesterday, the PDP urged the officer to "avoid the pitfalls of the last IGP, who has gone down in history as the most corrupt, devious and reckless police officer to hold the post." It further advised him to remove all templates of election rigging contained in the handover note that would be presented to him by Idris. According to the party, the outgoing police boss would be remembered as "the only IGP in our political history who surrendered the responsibilities of his exalted office to the whims and caprices of politicians who share courtesies with the Buhari Presidency. He defied the need to secure troubled areas and watched carelessly while an integral part of our nation was engulfed in bloody clashes." It said: "Idris will be remembered as that police officer that had a penchant for framing innocent Nigerians with ridiculous allegations. Throughout his inglorious tenure, he functioned as the commander of the militant wing of the APC, just to retain his office and remain in power." Also, PDP National Chairman Uche Secondus at a rally in Osogbo, Osun State, yesterday urged Adamu to avoid the errors of Idris who "served the All Progressives Congress (APC) cabal and not the Nigeria Police or the Nigerian people." The Coalition of Political Parties (CUPP), on its part, urged Adamu to release all political detainees especially Senator Dino Melaye and activist, Deji Adeyanju. Addressing a world press conference at its headquarters yesterday, CUPP spokesman, Ikenga Ugochinyere, said the coalition "and many other Nigerians welcome the end of the controversial IGP's tenure as a major victory for our democracy. We therefore urge the incoming IGP to see his appointment as a service to the nation and to all Nigerians, irrespective of political and religious affiliations." The CUPP consequently suspended its planned mass protest against the police over alleged anti-democratic practices. The seven-day respite is to allow Adamu settle into office. The coalition furthermore held a mock birthday ceremony for Idris, describing the cutting of a cake as symbolising the end of an era of ignominy in the history of policing. 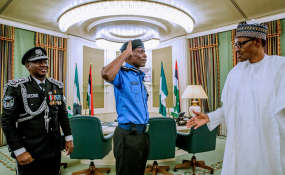 In another reaction, pro-democracy group, Human Rights Writers Association (HURIWA), issued a statement asking the new IGP to change the public relations dynamic of the institution from a "lying force" to a people-friendly agency. Adamu meanwhile has reversed the transfer of Lagos State Commissioner of Police (CP) Imohimi Edgal who was swapped with his counterpart at the Police Ordinance Department (EOD), CP Kayode Egbetokun. An order from Force Headquarters on Sunday had directed that the transfer be carried out immediately. Both CPs had scheduled a handover and takeover session for 3:00 p.m. yesterday. But while the closed-door meeting held, a phone call from the new IGP reportedly ordered the ceremony to stop. Edgal, who briefed reporters alongside Egbetokun, said: "Gentlemen of the press, are you here for the handover and takeover? Are you here because you love me or you are eager for me to leave? Well, there is a directive from our boss that the status quo should remain till further notice. We shall brief you later." Egbetokun, who had arrived with his chair, personal belongings, and staff, said: "We are government agents and we are always taking directives. Thank you all for coming." Edgal left immediately for Abuja to meet with the new IGP, following a gun salute by elated police officers.